Do you cook enough for an army when you only have three mouths to feed? You’re not alone. About one-third of household waste is caused by people preparing too much, then not eating it. Your intentions to provide enough for everyone are good, but preparing too much can inadvertently lead to overeating, wasted food and wasted money. 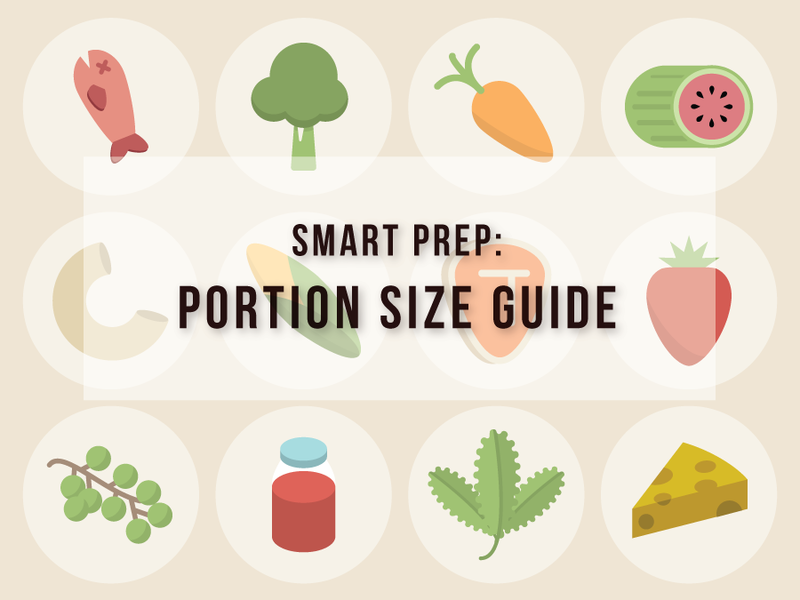 To help you get a handle on portion distortion, we created a printable list of portion sizes for common foods. 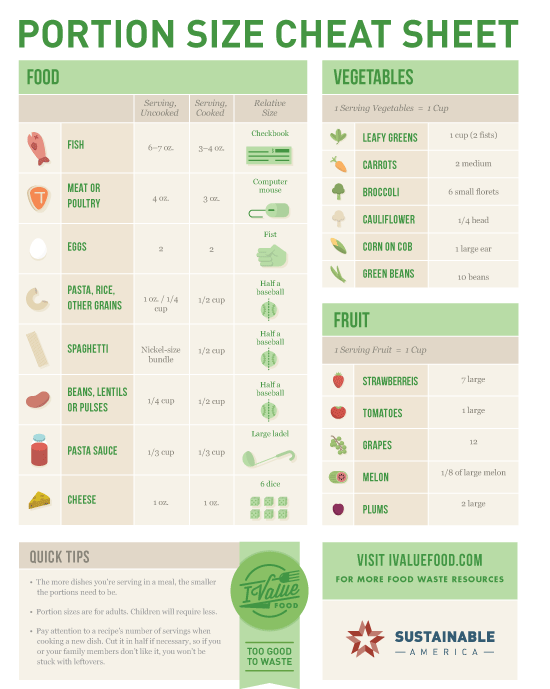 Use these as a guide when planning, cooking and serving meals. 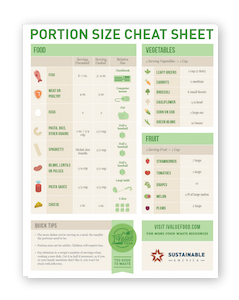 • To avoid overcooking, Love Food Hate Waste, the U.K.’s food waste campaign, has a great portion planner tool, and the National Heart, Lung, and Blood Institute offers a pocket-size cheat sheet for serving sizes of popular items in each of the food groups. • A variety of meal planning apps like CookSmarts and Plan to Eat are also available to choose recipes and generate the appropriate weekly shopping lists so you don’t overbuy and overcook. Supermarket-chain Publix does something similar with its Aprons program, which offers customers simple recipes with complete shopping lists. Online meal-planning service eMeals has a budget-friendly meal plan designed for efficient ingredient use throughout the week to limit spoilage and waste. • Several new meal-delivery companies, such as BlueApron.com and Plated.com, will actually deliver to your door the right amount of ingredients you need to make perfectly portioned meals. • You could try using a special “portion plate” that illustrates the correct serving size right on your dish to get more familiar with how much food should really be in a meal. 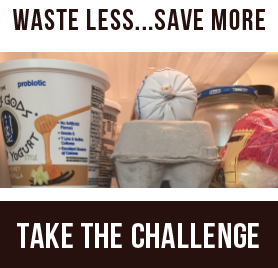 There are tons of portion control gadgets designed for weight maintenance or loss that will also help eliminate leftover food waste. • If you do cook too much at the occasional meal, don’t despair. You can safely store leftovers by refrigerating them promptly and covering or sealing them in airtight containers. Leftovers will keep in the refrigerator for three to four days or three to four months in the freezer. Blue Apron offers helpful tips on how to reheat everything from steak to risotto and reinvigorate a meal’s fresh-cooked glory to make leftover night more appealing. Also, consider using leftovers creatively, such as turning leftover cooked veggies into ingredients for soup or create burritos with leftover meat and rice.